It's All Geek To Me! The songs said it had taken a thousand blades to make it, heated white-hot in the furnace breath of Balerion the Black Dread. The hammering had taken fifty-nine days. The end of it was this hunched black beast made of razor edges and barbs and ribbons of sharp metal; a chair that could kill a man, and had, if the stories could be believed. Valar More-Glue-Plz: All men must DIY! The songs say it took 59 days and 1000 blades to make the iron throne. I made an iron throne in a weekend with around 100 swords. Mine is, to be fair, quite a bit smaller and rather less judgmental of the ruler’s leadership capability. I had a lot of fun making this throne. It was inspired by a few other cocktail sword Iron Throne crafts I’ve seen around (like this one), but I’m really happy with how this one came out. I aimed for a more irregular sword arrangement, which I think better fits the descriptions in the books and makes it look a little more like a piece of furniture capable of punishing unfit rulers. An ironwork monstrosity of spikes and jagged edges and grotesquely twisted metal. I created a base from styrofoam and a plastic dish that were otherwise headed for the recycling bin. I coated this with clay to make it look less square, and added texture and depth. The next day, I used a glue gun to cover the chair in cocktail swords, arranging them in a fan shape similar to the one in the HBO show, and cutting swords into smaller pieces as necessary. It looked pretty ugly at this point. I tried to clean up some of the inevitable hot glue strings, but I don't think I needed to be as fastidious as I was. They added some pretty cool texture. I spray painted the entire ensemble silver. I was pretty impressed with how great it looked at this point - but it looked a little too flat and pristine. To add more depth and to make the chair look a little more aged, I drybrushed black paint into the crevices to add texture. The gluing portion went much faster than I expected, while the painting portion went slower than I thought it would. In retrospect, it may have been easier to spray paint everything black and highlight some pieces in silver, but I don’t have silver paint or black spray paint handy. For most of the year, it sits on my bookshelf next to my Patrick Rothfuss books. I pull it out for Game of Thrones parties, where it makes a great centerpiece and conversation starter. 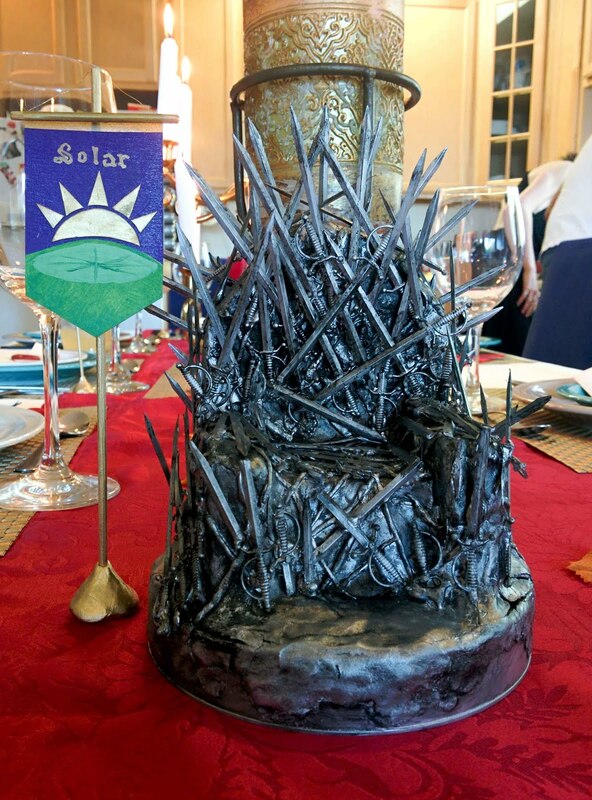 Read more about the myths & superstitions surrounding the Iron Throne - great food for thought while you're making your very own Iron Throne centerpiece.